Beautiful Beachfront Vacation Home POOL- shared between 3 houses. Charming, 2600 square foot, two story house is beautifully decorated. 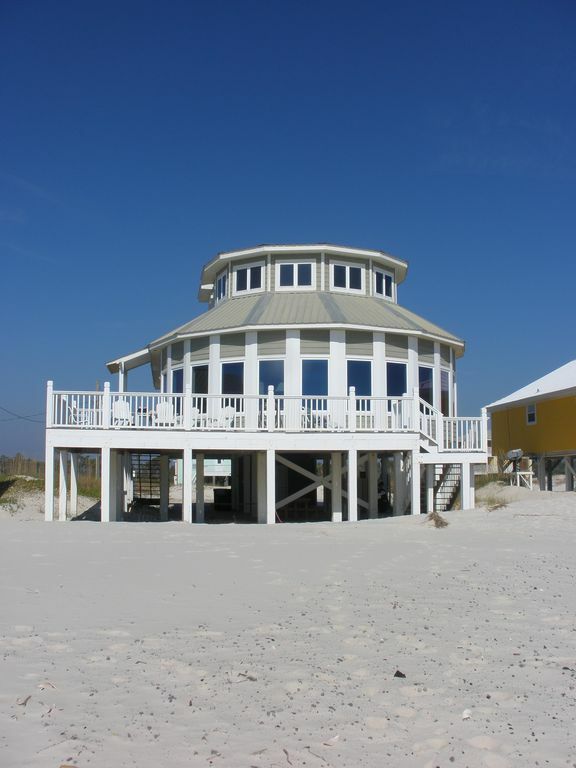 It features a stunning view of the Gulf, located directly on the Beach near Fort Morgan, Gulf Shores, Alabama. Pets are NOT allowed, No Smoking. White sand non-commercial beach - great for family activities. Furnished deck facing beach, under house parking, and outside private shower to wash off the sand. Many of our guests return each year. Once you've experienced our wonderful vacation home, you'll want to come back again and again. For other properties owned by Kent and Karen Gable Great for Weddings or reunions (accommodates up to 28 adults). All on the same Cul-de-sac. We live and work in Cullman AL. Our family consist of 2 grown daughters and their husbands and 1 grown son. We currently have 4 grandchildren. We decided to purchase a house in Fort Morgan area because we love the beach, but not the crowds. Family vacations have always been important to us and we have traveled to Gulf Shores as long as I can remember. This house is a single dwelling, right on the beach. I fell in love with this place the moment I stepped out of the car! We also have an outdoor shower. The pool services 3 houses. This house was perfect for our family stay. Very clean and everything we needed was there to make our stay enjoyable. The owners are very friendly and helpful. Will come back. Nice house with fantastic gulf and beach views. Super nice private beach. This was our second stay and we highly recommend this to anyone bringing family and in our case, our extended family. Plenty of bedrooms, bathrooms and space to stretch out for our crew of 7 adults and 4 young grandsons. This home has the nicest piece of private beach anywhere near this part of the peninsula. Our 4 grandsons played in their sand fort complex we built nonstop for the whole trip. It was priceless to watch. Karen Gable (the owner) is super friendly and responds promptly to any questions. Feels like family talking to her. The "fort" that your grandsons built was taken over with my grandson and 2 granddaughters. Of course the girls had to dress it up with seashells and turned it into a castle! Memories are what vacations are made for! Thank you for choosing our little piece of paradise. Loved the house and the beach! There was 10 of us and plenty of room! The kids really enjoyed the pool and I loved watching the dolphins! Thank you Karen and Kent for sharing your beautiful beach house we had a wonderful vacation!!! Thank you so much for letting us know about your stay at coco beach. We always love being able to help families send time together. Please remember us for future visits to our little piece of the sand at fort Morgan. The only downside was having to leave after our week was over! Thank you for taking the time to submit a review. I’m so glad to hear of the memories that y’all got to make. Please continue to remember “coco beach” for future visits to the beach! Beautiful views and clean house. The house was beautiful and very clean when we arrived. We had a wedding on the beach in front of the house then a reception under the house afterwards and the house was perfect for this. The views were amazing from the main rooms in the house directly towards the water! Can't wait to stay again!! Really like the layout of the house. Very comfortable, great views from living-kitchen area. Saw dolphins every morning around 8:30. Restaurants and shops 5 minutes away. Will definitely return. Owners are really very nice. I feel like I made some new friends. Thank you very much for your review. I feel like my sister was hit with you and your family. It is so great having her to help out with the running of the place. I hope to hear from you again and again! That is what we strive to do is to make this your special place too.